Carolyn Swords boxes out Sylvia Fowles. Photo courtesy of Las Vegas Aces. Minneapolis – A balanced team effort by red-hot Las Vegas Aces Friday gave them their fourth straight win, and handed the Minnesota Lynx their third loss of the last five games. Kayla McBride led five Las Vegas players in double figures with 24 points and a career-high nine assists, while rookie A’ja Wilson and Carolyn Swords each had double-doubles: 11 points for each, and 15 and 11 rebounds for Wilson and Swords, respectively. Tamera Young added 13 points and Kelsey Plum, 11. The Aces went on a 10-1 run to end the first half, and led for most of the last two quarters. Lynx forward Maya Moore hit two straight shots with 2:33 to play to bring her team within four points, but Young answered the shot, and then Wilson and Swords hit back-to-back shots to seal the win. 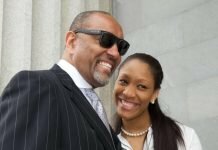 McBride said the team effort was the key to the game. 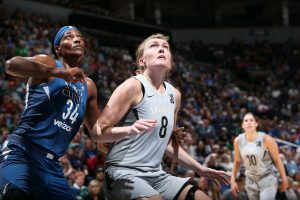 Lindsay Whalen led Minnesota with a season-high 22 points, while Seimone Augustus had 14 points and Sylvia Fowles, 17 rebounds. Maya Moore scored 12 points. Las Vegas coach Bill Laimbeer said defense on top scorers Fowles and Moore was their focus going into the match up. 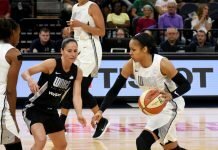 Without veteran Rebekkah Brunson, out due to a hamstring injury, the Lynx were not able to run with the Aces on either end of the floor. Playing with just ten active players, the team looked worn out and defeated in much of the second half, allowing the visitors to run their game plan to perfection and outscore the them in three of the four quarters. Young knocked down shot after shot for Las Vegas, and just when Minnesota looked like the team might make a late run, Las Vegas made defensive stops. Aside from Whalen, none of the other Lynx starters could get anything going offensively, including Moore, who was forced to play more minutes in the absence of Brunson. 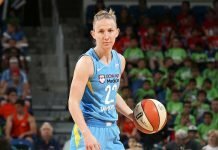 Moore made just five of her 15 shots – the fifth game in a row in which she didn’t reach 20 points after doing so in seven straight games between June 16 and July 1. Fowles struggled as well, going 2-9 from the field. The reigning most valuable player has failed to reach double figures in three of the last five games. And when Fowles and Moore don’t play well, Minnesota doesn’t win. Reeve’s frustration was seen with limited words in the postgame press conference along her actions. After the game, Reeve shook hands with Laimbeer before forgoing the rest of the line and walking directly to the locker room. Reeve and Laimbeer have a friendly, yet competitive friendship, with Reeve working under Laimbeer in 2006-2008 with the Detroit Shock. In the three seasons together, the Shock went to three consecutive WNBA Championships, winning twice (2006, 2008) and losing once (2007). Laimbeer left a few games into the 2009 season and in 2010, Reeve accepted the job with Minnesota. The win gives the Aces their tenth of the season and puts them less than one game from playoff contention after a rocky start. Defending champion Minnesota is now 12-9 in what has been their most inconsistent season in years. After starting 3-6, they won seven in a row and now have alternated winning and losing, including dropping a game to the league-worst Indiana Fever. Las Vegas has games against Los Angeles, Phoenix, and Indiana before the All-Star break, while Minnesota welcomes Connecticut to Target Center Sunday before games against Indiana, Phoenix and New York. Wilson scored in double figures for the 22nd time to start her career, one away from the Aces’ franchise record, held by Natalie Williams in 1999. The WNBA leader is Cynthia Cooper, who scored in double figures the first 92 games of her career. Second on the list is Los Angeles’ Candace Parker (32 in 2008). Augustus is to date the only player to average more than 20 points per game in her first season, averaging 21.9 in 2006. Wilson is also on pace to be one of just four players in WNBA history to average a double-double in their first season in the league. Prior to Friday’s win, Wilson was averaging 20.6 points per game and 8.5 rebounds. Her 15 rebounds in Friday’s victory raises her average to 8.8.